The random number generator that I use to pick a record to write about on here dumped me right at that awkward ‘pre-alphabet’ part of the list – the place where artist names start with numbers or symbols rather than a common-or-garden letter. So, the mysteriously-named -a+M, and an equally mysterious record. This and a couple of other things from the Lancashire And Somerset label were, I think, bought at the same time, as I like the label’s style and wanted, a little while ago, to get a mini-overview of some of their releases. I have no idea who -a+M are, the label’s website doesn’t offer much help, and it’s not the kind of name that lends itself to easy Googling. The rear sleeve does suggest that there was once a website at www.minusaplusm.co.uk, which would have been helpful (I hope), but it’s no longer in existence (unfortunately). The record contains eight tracks of mellow acoustic guitar instrumentals, with two guitars weaving their melodies into each other in a way that hints at post-rock complexity and structure, but with a sound that feels more like experimental folk music. It’s not unpleasant at all, and it has a sonic clarity that’s refreshing and precise. 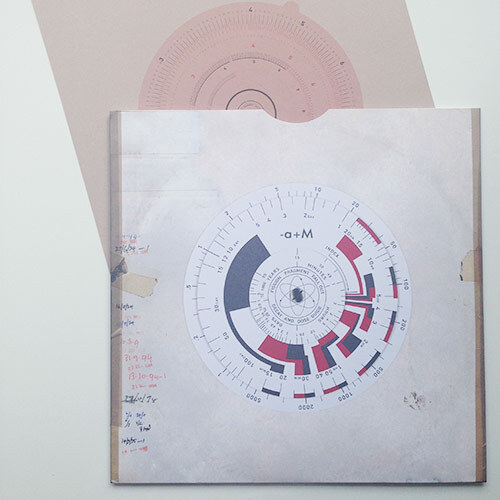 The artwork is based around a Dials concept led by the record’s title: the front and back cover shows cleaned-up and modified graphics of this fallout decay and dose guide: ‘The Commander’s Radiation Guide’, manufactured in the 1960s by a German company called Nestler. It’s been altered to include the artist name on the front, and the label name, track titles and catalogue number on the back. A 10″-sized numbered insert (mine is 264 of 300) shows two images of what I presume to be dials that were part of the inner workings of this radiation guide and calculator. It’s a really nice-looking artefact, this record; it would be great to see a limited edition of one that was packaged in a real Commander’s Radiation Guide, screwed together in the centre and mounted on a packet with date stamps and handwritten notes, as the two-dimensional sleeve suggests may have once existed. 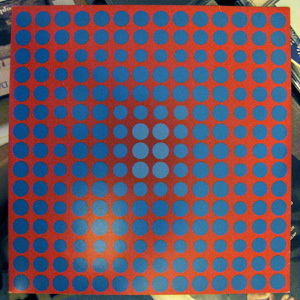 This record was something of a holy grail to me for some years, before I finally snagged a copy (for a very reasonable price, too) around five years ago on eBay. I was fully conversant with the tracks on the record for a long time in advance of my purchasing it, because of a tape made for me shortly after its release, by a guy called Adam who I used to correspond with. Adam was in a micro-indie band called The Losers, and very good they were too. They once released a split single with Action Painting! that I remember enjoying very much; not least because it came packaged within a folded sheet of stripey wallpaper. Adam made me several tapes, and one of them had the entirety of Perfect Sound Forever on it, and I loved it. Home taping was, in this instance, not killing music, but exposing it to somebody that had no idea that such music existed. Admittedly, I didn’t rush out and buy the record. I listened to this taped version over and over and over many times. But hey – you can’t have everything. I couldn’t argue with his logic. It was fun, and I still have that jigsaw piece somewhere. 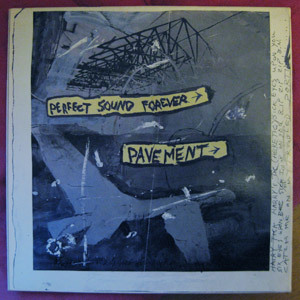 Anyway: this 10″ record is a slab of perfection, and I consider it to be one of Pavement’s finest moments. There have, admittedly, been many fine Pavement moments, but this record encapsulates their errant shambolitude, and how it aligns perfectly with their innate sense of melody and enjoyment. (Turntable update, for those who are following this: on Thursday evening I’m picking up a temporary replacement for my dear departed old turntable. A kind offer from my friend Mark, which is very much appreciated. So from Friday onwards, I’m back in the land of the living – the land of vinyl). Aha, good work, random number generator. You’ve selected a record that I have several interests in. Firstly, I created this record. Kind of. Now, I wasn’t involved in the music, you understand, but Fourier Transform is my record label. It used to be a label owned and run by my good pal Simon (yes, another Simon) and I, but he bowed out a little while ago. So now it’s ALL MINE! The feeling of wanting to release a record; working with the artists to get it all together and then seeing it come to fruition in the form of boxes of real, physical items, is pretty unbeatable. The day I received delivery of these records – in a car park outside my workplace, proper classy – was very exciting. Did the cover artwork come out? Was the blue vinyl everything I hoped it would be? On all counts – hell yes. I was very happy. I love this kind of thing: I read in an issue of Wire some time back that this band, who sounded great from the all-too brief description that was given, were giving away free 10″ records to anybody who took the time to e-mail them. The word free is enough to pique my interest at any time, and so a polite e-mail was fired off, and quickly returned with a polite e-mail asking for some payment to cover postage from the US to the UK, but emphasising that ‘the record is itself free’. Looking back at my saved e-mails, it seems that Wooden Shjips responded to my e-mail after only sixteen minutes had passed from its being sent. Isn’t it great when a band is not only good listening, but also both polite and punctual? Wooden Shjips are indeed good listening. 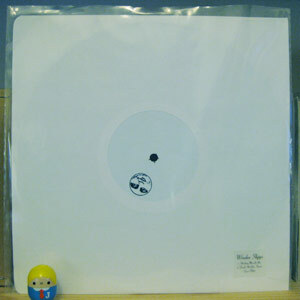 The ultra-minimal packaging here (nothing more than a stamped white label 10″ in a white sleeve with a miniscule clear sticker in one corner) is nice and understated, leaving the music to speak for itself in all its repetitive, droney glory. Many people would conside ‘repetitive, droney’ to be a negative description of a band, but not me, bub. I’m a long-term fan of not only original exponents of Krautrock and psychedelia, but also their more modern counterparts. Give me Spacemen 3, Pink Floyd circa Piper At The Gates Of Dawn through Meddle, Loop, Can, Red Crayola, etc etc etc, and I’m a happy chap. This 10″ is a fine marker in the sand for a band that combines all of the things I love about their brand of music – it rocks hard, but it’s super-relaxed; it’s tripped-out and hippyish, but it’s moody and sinister. Note to anybody reading: I like free vinyl. Feel free to contact me on this front. If I was from Glasgow I’d be able to tell you how the Vesuvius label fits into a great musical culture of the city, stretching back many years. However, I’m not, so I can’t. But I do know that it does. This was their first release, a proper indie job with photocopied insert, hand-stamped labels and no concessions to The Industry. To be honest the musical quality is variable, but it’s more that this represents the ability of people to release records on their own terms that makes me like this kind of thing. Plus, the 10″ format is always a delight. On here we’ve got Melody Dog, Manxish Boys, Sally Skull, Hello Skinny, Lung Leg, Cotton Gum, The Yummy Fur and Starstruck. Not particularly a list of legendary names, I’ll grant you – except for The Yummy Fur of course, members of whom went on to form Franz Ferdinand and blah blah blah. Anybody who was deeply entrenched in the mail-order-driven world of indie-pop in the mid-90s will probably recognise the names, as they graced many an A6 flyer for a fanzine or a record that would get stuffed into an envelope before sending out, er, a fanzine or a record. Happy pre-internet days. Once when visiting my friend Marceline in Glasgow we were wandering through town and she pointed out to me a doorway that apparently led to the organisation run by Pat who used to run Vesuvius. You know what though? I’ve no recollection of what that organisation is. And I’m not being enigmatic, I’ve just got a rubbish memory.